In recent weeks, you might have noticed a large art work in the front yard at the Arts Center. 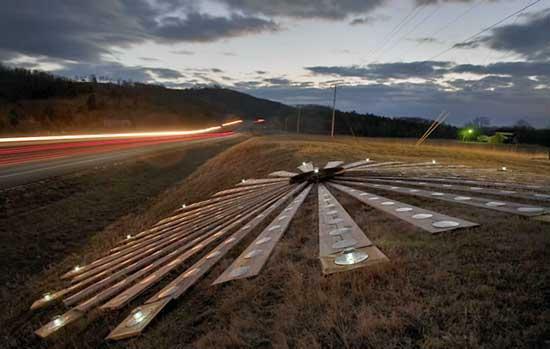 Cannon County resident and Vanderbilt Professor of Philosophy, David Wood, who refers to himself as an Earth Artist installed “Soft Time: Heliotrope III” on the front hill overlooking 70S. Heliotrope is a construction bearing witness to our total dependence on the sun, and the need to reaffirm that relation in new ways. “Folded over the bank at the Arts Center of Cannon County, it shows how we can often adapt to nature rather than force it to conform to our plans” explains Wood. This is the third version of Heliotrope (the others floated at the University of Richmond, Virginia, and in Centennial Park, Nashville). A sister work is installed on the edge of the Vanderbilt campus ('Awakening'). Another piece will be made in Nijmegen in the Netherlands this summer. He has made larger installations in Australia, Albuquerque, Santa Fe, and Colorado. Site works in general date back to the times of prehistoric megaliths, and to native American mound building. In recent times, the concept and construction of Earth Art flourished in the US from the 60s onwards. Wood has been developing Yellow Bird Sculpture Park in Woodbury over the last several years, inviting other artists to collaborate and inviting the public to participate. Information courtesy of Neal Appelbaum. Thanks for the rundown on this. One can see how it is directly related to solar collection panels. How's that been working for them lately?? I haven't seen the sun but one day in the last 2 weeks! How is Mr. Wood able to do this on the state right of way? I am glad that I'm not the one who has to mow around that thing. The lights from this are very distracting when coming down the road. I believe it is too close to the road. I wondered what this was. the first time i saw it i thought it was a bunch of trash throwed out on the ground. Typical. Its a real stretch of the imagination. This piece of junk as it appears has really demonstrated how outside the box we have learned to operate. Everything is not good.